For children turning 6 in that year. Welcome to the Shearwater Kindergartens. This is a special time for your child as they journey through their 5th and 6th years of development. Until the age of 6 or 7 children learn primarily by imitation: seeing and doing. 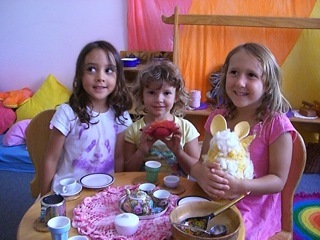 They are open to almost all influences in their environment so it is the first priority of a Steiner School Kindergarten to create a warm, loving, homely environment in which children do better if intellectual work is postponed. 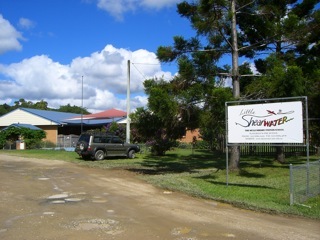 It is through ‘hands-on’ activities that the seeds for later subjects are sown. The Kindergarten timetable consists of a rhythmical flow of different activities: artistic, social and physical. These include painting, drawing, modelling, play-acting, puppetry, singing, stories, poems, games, handicrafts, cooking, gardening and free play. Using a variety of natural materials fosters a scope of imagination in play which many finished toys don’t provide. It is also a time of wonder and veneration as they learn more about the world we live in with Father Sky, Mother Earth and Sunny Sun. The beginning of writing in the Kindergarten at Shearwater is quite difficult to see because there are no actual letters written. However, letter forms can be detected everywhere and these forms are made by the children unconsciously in the widest possible variety of activities. For example, we might reproduce the ‘W’ of water in a watercolour painting or a two-branched tree might be drawn representing both the tree and the ‘T’. It is an important Steiner principle that the strongest connection be made between the hand-and-eye faculties as, if there is even a slight lack of co-ordination between the dexterous and the visual skills in a child, then problems in writing will almost certainly be present. Therefore the attempt is made to develop these skills before the child enters his period of formal learning – that is from Class 1 onwards. This is also consistent with the method employed in the School of teaching writing before reading. The child’s kindergarten day is full of activities as he/she is encouraged at this age to develop physical intelligence. We stress that every member of the child’s physical body should be educated to be (by age 7) a sensitive, strong, finely tuned instrument, which will serve his higher members and faculties for the rest of his life. The particular faculty dealt with here is writing and following are some methods employed which build the strong foundation mentioned above. Eurythmy, as an art of movement, would take considerable space to elaborate upon. It is whole body movement within a set of disciplines. These are based on human language and the actual forms of the written word. An ‘O’ is a circle; the Eurythmy gesture for the sound ‘O’ is a circle made by the body of the child (arms in this case). All letters of the alphabet have a separate gesture in Eurythmy. In the Kindergarten, the child is not made conscious of the letter forms he is gesturing, yet, subliminally, they are entering his whole organism in a healthy way so that, later on, he will feel that he already has a relationship to those forms which he is then learning consciously as writing. Eurythmy, as a principle, enters almost every aspect of the Steiner Kindergarten world because, strongly based on imitation, it is recognised as the most effective educational method for children under 7. The Teacher gestures, the child copies and therefore imitates stylish movement. The Arts are used deliberately in Steiner schools to draw the child’s consciousness right into the various parts of his body. In acting, miming and dancing, the hands actually become the artistic expression themselves. For example, if the children play or mime, they have to tell a story mostly with their hands. It is found that the general uninhibitedness and confidence that these activities encourage stay with the children as they grow. Each of these activities is a preparation for hand confidence, and will be required for good writing later on. A confident approach to writing is a most valuable asset and it is one that allows a child’s individual writing style (considered so important in a Steiner school) to be both legible and attractive. Painting requires an acquired degree of fine motor skills, especially as the children are generally given transparent watercolours to paint with. The watercolour brush is the most basic and responsive writing instrument and lessons on grip, slope, pressure etc. are learnt here long before the child actually writes letters. It is through these conscious shaping, colour activities that delicate application is educated into the child’s hands right down to the fingertips; this helps him in the artistic forming of letters later on; so that his writing is beautiful – not just correct. Whilst painting, they also learn tactile sensitivity and shaping principles – principles designed to bring freedom and harmony to the hand-eye coordinative faculty. The child expresses all the wide world of forms on the two dimensional page. Most of the forms he draws and masters will have direct application in the written letters to follow. There are lots of letters hidden in a child’s drawing of a house, for example the letter ‘H’ can be found everywhere. In the many drawings they do in Kindergarten they would have drawn the whole alphabet (unconsciously) many times over. The drawings are generally done using beeswax crayons and certain exercises encourage the vertical, the horizontal, oblique or curved line principles – predicating those found in written letters. Musical instruments and singing games contain many of the same basic elements as writing – particularly it’s rhythmic quality. Children have a long struggle overcoming basic arrhythmic disadvantages and it is found that if a child has difficulty in his rhythmic organization, then his writing will suffer – for instance from poor flow and chronic slowness. The more music in the Kindergarten, the more likely will it be that the children will recognise their basic rhythmic patterns and harmonise them. We know that to help a 5 year old achieve success in beating a basic rhythm on a drum will also help him to write better and faster in his primary years. We also see that for some children this is sometimes a major achievement! Modelling with bees-wax or clay actually strengthens the finger muscles, providing a basis for later consistency in writing. A great deal of bad writing in children is due to the fact that the fingers were not exercised sufficiently when the muscles were forming and they remained weak – this symptom can be seen in the child who complains that his fingers hurt when he is writing. Healthy, strong fingers are necessary for control of the writing instrument. The wonderful finger-tingling massage that occurs when children mould clay or beeswax is a sure sign that the blood flow is being stimulated right into the peripheral capillaries and that their finger muscle development is taking place. The children model many forms from the real world; e.g. little green snakes, which later on (in Class 1) become the abstract letter form ‘S’ as we know it. Therefore, unconsciously, the children are already developing a familiarity with their letters. Here we deal with the widest possible variety of activities, the least not being teaching a child to tie his shoelaces. These activities educate the hands and fingers in a variety of skills, all of which can only enhance good writing later on. Weaving encourages rhythmic consistency; sewing – attention to detail and definitive skills (like threading a needle); and the many crafts like knotting, tie-dying, finger-knitting, etc. assure dexterity – the principle faculty required for writing. All these activities also encourage accuracy (dotting the ‘i’s). The hand, which has been intelligently educated, will, hopefully, write intelligently. The dolls and toys in the Shearwater Kindergarten stimulate the child’s imagination, they are of high quality and many are inherently intelligent. Children playing with toys mostly play with their hands – how well they do that can determine how well they later write. Intelligent, well-made, imaginative toys aid their writing skills later on. They make many of their toys so the children get double tactile experiences from them (like their hobby horses). 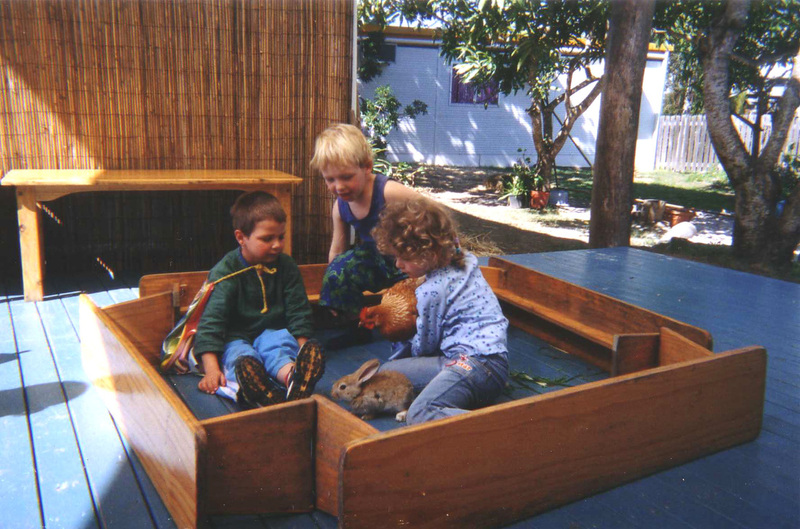 Nature play is when children experience the higher intelligence wrought in the created world – they are encouraged to play with rabbits, stones, pinecones, shells, frogs – whoever or whatever happens along. Nature’s textures are marvellous and these truly educate the hands intelligently. All of these activities (plus many more) assist in the general strengthening and versatility of the child’s whole body. Their aid to later writing is to provide the child with strong capable upper limbs – especially the hands (fingers were mentioned earlier with modelling). The children must be able to grasp securely, maintain pressure and be able to control the hand movements in a free way without trembling. It has been found that children who are not reasonably well developed physically, cannot do the amount of writing normally required by a primary school child so they fall behind and become demoralised. The Shearwater Kindergarten assures that children spend a good deal of their day developing strong, healthy bodies by climbing, gardening, sand play, building, swinging, etc. Good writing (especially in the younger years) is dependent on ‘whole body’ participation. By the time the children enter Class 1, they are so ready to write that the teacher can hardly keep up with them, and they retain a love for writing right through their school years – a writing which has (as far as the child’s potential allows it) inherent in it: movement, confidence, style, sensitivity and beautiful form shaping, consistency, rhythm and speed, skill and accuracy, imagination and intelligence, strength and quantity. Each day there is a routine that the children follow with different activities in the main and middle part of the day. drawing, bees wax, sewing, fruit cutting, etc. 9.55am Change shoes. Wash Hands. Toilet. Sit on benches outside room ready to come in. 11.00am Children take chairs down to work area for Main Activity which varies each day. 11.30am Wash hands and sit at outside tables for morning tea verse. Morning Tea. Children acting as Waiters/ Waitresses serve each other. 12.00pm Creative play. 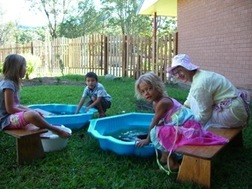 Children play outside or remain inside as they choose. 2.15pm Rest time: children make up their beds with their sheet and pillows then lay on beds quietly looking at books, doing jig-saw puzzles, etc. Change of clothes (Please try to keep active designs on clothing to a minimum and also the wearing of black, as it isn’t conducive to your child’s inner development). If your child wants to bring a toy, we would prefer that they bring only one or two in to play with as they can very easily get lost at school. The toy also needs to be an appropriate type (i.e. no war, fighting/horror toys). We celebrate your child’s birthday at Kindergarten. We will need a birthday cake, photos of your child and a written story/verse about your child. This will all become clearer around the time of your child’s birthday. Please contact us a week or so before the birthday. If your child will be catching the bus you will need a bus form from the Office.